A contender for the most versatile compact stompbox delay available. TonePrint. Variety of delay effects. Tap tempo. Pedal doesn't mute instantly when holding down the footswitch for tap tempo. There's little we could ask for in a delay pedal that the Flashback doesn't offer. 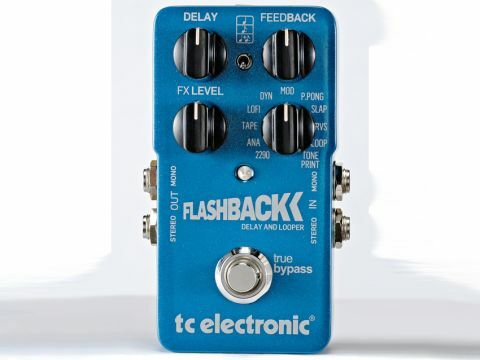 "The Flashback recalls TC's Nova Delay in the number of distinct effects it offers. Its fourth knob is a rotary switch that can call up nine different delays." The pedal has four knobs - one of which is a rotary switch - plus a three-way switch, and features selectable effects variations. In designing the pedal, TC wanted something that was fast, easy and intuitive to use, with the ability to change sounds on the fly with a few knob tweaks. TC has made a number of these alternative 'tunings' available for each pedal, all easily accessed and downloaded into it from a special TonePrint website. And these aren't just voicings created by some Scandinavian boffin in a white lab coat. Instead, TC has asked a bunch of the world's best guitar players to make TonePrints for the pedals. The Flashback recalls TC's Nova Delay in the number of distinct effects it offers. Its fourth knob is a rotary switch that can call up nine different delay effects plus the TonePrint setting as well as setting it up as a looper. The smaller three-way switch sets the timing division for the tap tempo function and offers quarter note, eighth note or both for a multi-tap repeat pattern - tap tempo being implemented by pressing the footswitch and rhythmically hitting the strings (the pedal mutes when you do this). Displaying a comprehensive selection of delay types, there's little extra that we could ask for in a delay pedal, especially one as compact as this. The 2290 setting offers clean-as-you-like digital delay, but if you want degraded repeats, there are three different flavours of them as well as a lush modulated delay and a very useful dynamic delay that lets the repeats come to prominence at the end of phrases. With 40 seconds in mono and 20 seconds in stereo, the looper offers a useful level of practicality, and whacking the strings for tap tempo makes perfect sense for guitarists. The TonePrint sounds that came straight out of the box offer a useful and nicely programmed variation on the named effect but, as at the time of testing theTonePrint website wasn't live, we weren't able to try out any of the signature sounds.